In paper the analysis of existing concepts of development in socionics had been presented. The issue of the development of children from the point of view of socionics and developmental psychology had been considered, and recommendations for the diagnosis of TIM for children of different age groups had been given. The author describes the concept of personality development from the point of view of a large number of parameters that determines the work of the type of information metabolism and selects various techniques for the development of certain aspects. Also, a methodology had been developed to measure the degree of development of the individual, from the point of view of socionics. Key words: socionic, personality development, psychology, levels of development, self-development, development of children, development methods, developmental psychology. There are described 7-year cycles in the development of the child. Recommendations for parenting are provided. Key words: education, development, cyclicality. This article is the tenth in a series devoted to organization of student studies, where they will learn mathematical apparatus of socionics. This time, the question will be considered of how, basing on the central sections of the socion, which are already “voiced” by bipolar traits, we can obtain, with the help of the known binary operation, two more “new” 16-element groups of the central sections of the socion, which include “unvoiced” sections. Key words: socionics, classical model of intertype relations, groups of central sections of the socion, cosets by the normal subgroup, factor groups, Augustinavichiute – Reinin traits, Jung – Minaiev traits. This article is based on a dual relations of my parents ILE and SEI. In the article analyzes different examples of interaction based on a functions of models and the signs of Augustinavichyute-Reinin. Key words: socionics, type of information metabolism (TIM), intertype relationships, ILE, SEI. Psycho-information space of ethnos. Modeling the mentality of the ethnos and the state. A new psycho-informational stratified model of ethnic community and state (a generalized socionic model) is suggested on the basis of the theory of psycho-informational state. 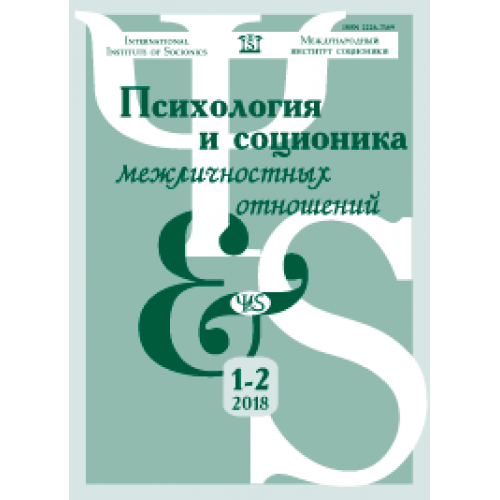 Effectiveness of the model usage for an analysis of today social-political processes, and, in particular, of inter-national relations, is shown on the example of the Russian and other ethnic communities. Key words: integral socionics, ethnic community, psycho-informational space, informational model, Russia, Turkey, Germany, USA, Japan, social and political processes, international relations, criminality. 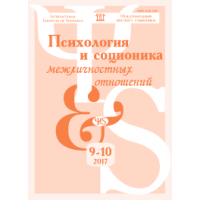 Issue # 1-2/2017 of “Psychology and socionics of interpersonal relationships…” jo..